Philip Humber of the Chicago White Sox pitched a perfect game against the Seattle Mariners by retiring all 27 batters he faced on April 21, 2012, as the White Sox defeated the Mariners 4–0. It was the 21st perfect game in Major League Baseball (MLB) history and the third by a member of the White Sox. It was Humber's first career complete game, although he had come close to achieving no-hitters on several occasions at several levels of organized baseball. The game was played in Seattle and broadcast regionally by Fox Sports in the two teams' metropolitan areas. Humber, a top pitching prospect from a Texas high school, attended Rice University, where he had a successful career. A high draft pick by the New York Mets, he debuted in MLB for the Mets before headlining a group of four prospects traded to the Minnesota Twins for Johan Santana. After two ineffective seasons with the Twins, Humber pitched a season for the Kansas City Royals. Acquired on waivers by the Chicago White Sox in 2011, Humber had his first successful season in an MLB starting rotation. The perfect game, Humber's 30th career start and his second of the 2012 season, totaled 96 pitches. Humber was named 2001 Texas High School Class 4A Player of the Year and enrolled at Rice University for the next season. Humber flirted with a no-hitter in college, pitching for the Rice Owls baseball team. On April 6, 2002, he held a no-hitter going into the eighth inning against the San Jose State Spartans baseball team. In that contest, he surrendered a pinch hit single in the eighth, but did not allow any runs until a ninth-inning home run. "I mean, I can't even put it into words. I'm just so happy. There are so many good things happening right now. This just adds to the list." The New York Mets drafted Humber with the third overall draft choice in that year's amateur draft. After pitching in the minor leagues, he pitched in five games for the Mets during the 2006 and 2007 seasons. He also came close to a no hitter in Minor League Baseball. On August 22, 2007, he pitched ​8 1⁄3 no-hit innings for the Triple-A New Orleans Zephyrs of the Pacific Coast League against the Iowa Cubs. Humber ended up with a no decision. The Mets traded Humber along with Carlos Gómez, Kevin Mulvey, and Deolis Guerra for two-time Cy Young Award-winning pitcher Johan Santana that offseason. Humber pitched for the Twins in 2008 and 2009 and then signed a minor league contract with the Kansas City Royals after the 2009 season. After pitching for Kansas City for 2010, the Oakland Athletics claimed him on waivers from the Royals, but waived him a week later, at which point he was taken by the Chicago White Sox. Humber nearly achieved a no hitter for the 2011 Chicago White Sox twice. On April 25, 2011, in the sixth start of his career, he took a no-hitter into the seventh inning against the New York Yankees at Yankee Stadium but, with one out, Alex Rodriguez singled up the middle, leaving Humber to finish with seven scoreless innings. Later that year, he took a no-hitter into the sixth inning against the Washington Nationals on June 26, but ended up earning a 2–1 loss when he surrendered a seventh inning home run to Danny Espinosa. In that contest, Jerry Hairston, Jr. broke up the no-hitter leading off the sixth after Roger Bernadina earned a hit by pitch to break up the perfect game in the fourth. In 2011, Humber pitched a career-high 163 innings, but expected to pitch more and build on his success with the departure of Mark Buehrle from the White Sox. Although the 2012 Chicago White Sox' rotation was said to be made up of five number three starters, Humber was the number five starter entering the season, of which his perfect game was Humber's second start. Humber was scheduled to make his 2012 season debut for the White Sox on April 10, but the game was rained out. He was then made available for middle relief. In his season debut, on April 16, Humber allowed one run and ten baserunners in ​5 1⁄3 innings, throwing 115 pitches. 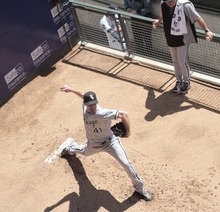 Philip Humber warms up on April 21, 2012, prior to throwing a perfect game. "I don't know what Philip Humber is doing in this list. No idea what my name is doing there, but I'm thankful it's there." Humber's second start of the season took place on the road in Safeco Field in Seattle, Washington, on April 21, 2012, and was played in front of a crowd of 22,472 people. The White Sox' catcher was A. J. Pierzynski and Humber's mound opponent, Blake Beavan, was a 2007 Texas high school player of the year. The home plate, first, second, and third base umpires were Brian Runge, Marvin Hudson, Tim McClelland, and Ted Barrett respectively. The game was broadcast on Fox, with Mariners' broadcaster Dave Sims and Eric Karros on the call and its duration was two hours, seventeen minutes. Karros, before the game, describing Humber's previous few games, remarked, "Gotta be a little better today." Beavan threw a quality start for Seattle, while Humber retired all 27 batters he faced, as his fastball reached 92 miles per hour (148 km/h). The closest a batter got to a hit was Dustin Ackley's fourth inning line drive over the head of right fielder Alex Ríos, which resulted in a warning track leaping catch. The Mariners began talking about Humber's dominance in the fifth inning as they sought to break up the perfect game. Humber recorded the final out on a full-count check-swing strikeout of Brendan Ryan. The ball got away from catcher Pierzynski, but home plate umpire Runge ruled that Ryan had failed to check his swing. Ryan took steps toward first base but, when he saw that Pierzynski had successfully gathered the ball and thrown to first, he argued the call with Runge. The FOX Sports broadcast never showed any angle which definitively proved whether Ryan had successfully checked his swing, but many fans and media members felt the call was incorrect. Had Ryan reached first base and no other baserunner been allowed, it would have been the first time in Major League Baseball history that an otherwise perfect game was spoiled by an uncaught third strike. Ryan himself refused to discuss the play after the game and offered nothing but praise for Humber. Humber finished the game with nine strikeouts; the other batters were retired with five groundouts and thirteen flyouts. Humber threw only 96 pitches, making this the first perfect game thrown in under 100 pitches since David Cone's perfect game on July 18, 1999. Humber had only started 29 Major League games prior to throwing his perfect game, making him the pitcher with the second fewest starts prior to throwing a perfect game, behind fellow White Sox player Charlie Robertson. MLB.com has made available the video of the last out. The game was only available on television in the Chicago and Seattle markets, because a game between the New York Yankees and the Boston Red Sox at Fenway Park, also on the network, was broadcast by more affiliates. Games between those two rivals generate a great deal of interest and receive extensive media coverage, including being broadcast on national television. Fox did, however, cut away from Yankees–Red Sox game, which was already in the seventh inning, to show the final three outs of Humber's perfect game, even in the Boston and New York markets. Humber being swarmed by teammates after the perfect game, the first of two to be pitched at Safeco Field in the 2012 MLB season. It was the 21st perfect game in MLB history and the first since Roy Halladay's perfect game on May 29, 2010. It was the third perfect game in White Sox history (tying them with the Yankees for most perfect games) after Charlie Robertson's (who threw the only other perfect game in April in MLB history) on April 30, 1922, and Mark Buehrle's on July 23, 2009, and the 18th no-hitter in White Sox history (tying them with the Red Sox for second most no-hitters). It was Humber's second start of the 2012 season and first career complete game. Humber went 1–0 with a 0.63 ERA in ​14 1⁄3 innings while striking out 16 over 2 starts that week, including the perfect game, resulting in his selection as American League Player of the Week for the week ending April 22. He received a congratulatory phone call from President Barack Obama, a noted White Sox fan, and received news that his perfect game would be memorialized with a plaque at the National Baseball Hall of Fame and Museum. Humber made an appearance on the Late Show with David Letterman on April 23, where he read the Top Ten List. Humber became the seventh former member of the Mets to go on to throw a no-hitter for another team. The other six are Nolan Ryan, Tom Seaver, Mike Scott, Dwight Gooden, Hideo Nomo, and David Cone. The New York Mets, at the time of Humber's perfect game, had never had a no-hitter thrown by a player in the 50-year history of the franchise (Johan Santana has since accomplished this feat). The Mariners went hitless for the third time in franchise history and this was the first time that no Mariner reached base. However, they went on to pitch two no-hitters in 2012, both of which took place at Safeco Field and winning both games 1–0. One of them was the first perfect game in franchise history, by Félix Hernández, making them the first team to be on both the losing and winning end of a perfect game in the same season, and marking the first time two perfect games were thrown in the same park in the same season. ^ a b "Humber's game works perfectly: Unheralded pitcher overwhelms Mariners for rare gem". Temple Daily Telegram. Associated Press. April 22, 2012. Archived from the original on September 13, 2012. Retrieved April 24, 2012. ^ "Roundup: Humber, Rice top San Jose St. 8-2". Houston Chronicle. April 7, 2002. Retrieved April 23, 2012. ^ a b c Powers, Scott (April 21, 2012). "Phil Humber throws perfect game". ESPNChicago.com. Retrieved April 21, 2012. ^ "Philip Humber Statistics and History". Baseball-Reference.com. Retrieved June 30, 2012. ^ "Statistics: August 22, 2007". MiLB.com. August 22, 2007. Retrieved June 30, 2012. ^ "Zephyrs History". MiLB.com. Retrieved April 23, 2012. ^ "Twins acquire Carlos Gomez, Philip Humber, Kevin Mulvey and Deolis Guerra from the New York Mets". MLB.com (Press release). February 2, 2008. Retrieved April 23, 2012. ^ Sanchez, Jessie (December 15, 2009). "Royals add Humber via Minors deal". MLB.com. ^ "A's claim right-hander Humber from Royals". MLB.com. August 25, 2010. Archived from the original on January 6, 2011. Retrieved April 23, 2012. ^ "White Sox claim pitcher Phil Humber off waivers". MLB.com (Press release). January 18, 2011. Retrieved April 21, 2012. ^ McCarron, Anthony (April 26, 2011). "Phil Humber, a former draft pick of both Yankees and Mets, arrives in New York with gem vs. Bombers". New York Daily News. Retrieved April 23, 2012. ^ "Nats send off interim manager John McLaren with series win over White Sox". ESPN. June 26, 2011. Retrieved April 23, 2012. ^ "The White Sox are ready to begin the process of replacing franchise icon Mark Buehrle". MLB.com. February 22, 2012. Retrieved July 2, 2012. ^ Van Schouwen, Daryl (March 20, 2012). "Expect a good start from White Sox' rotation". Chicago Sun-Times. Retrieved April 24, 2012. ^ Van Schouwen, Daryl (March 29, 2012). "Spring-training recap: White Sox 3, Dodgers 1". Chicago Sun-Times. Retrieved April 24, 2012. ^ "Chicago White Sox – TeamReport". Chicago Tribune. Reuters. April 11, 2012. Retrieved July 2, 2012. ^ a b c d e Larue, Larry (April 22, 2012). "White Sox pitcher Philip Humber throws 21st perfect game in history to stifle M's, 4-0 27 UP, 27 DOWN: White Sox pitcher Philip Humber throws 21st perfect game in history to stifle M's, 4-0". The Olympian. Retrieved April 25, 2012. ^ "White Sox vs. Mariners Saturday, April 21, 2012:box score". MLB.com. April 21, 2012. Retrieved April 23, 2012. ^ MTB.TV archived game at 00:15:36. ^ "How "Perfect" Was Philip Humber's Perfect Game?". Village Voice. April 23, 2002. Archived from the original on May 27, 2012. Retrieved June 4, 2012. ^ "Philip Humber Throws Perfect Game Against Mariners?". April 21, 2002. Retrieved June 4, 2012. ^ "Brendan Ryan refuses to discuss check swing, praises Philip Humber". CBS Sports. April 22, 2002. Retrieved June 4, 2012. ^ "White Sox' Philip Humber, At Last, Reaches The Top With Perfect Game". Baseball Nation. Retrieved April 21, 2012. ^ "Humber completes perfect game". MLB.com. 2012-04-21. Retrieved 2012-07-10. ^ a b c Hiestand, Michael (April 23, 2012). "NFL draft's spontaneity takes hit". USA Today. p. 3C. Fox's New York Yankees—Red Sox game went to 90% of the USA, but Fox switched all households to the end of Chicago White Sox pitcher Philip Humber's perfect game vs. the Seattle Mariners. ^ "Bitter Rivals Face-Off at Fenway For 100th Anniversary Weekend Yankees vs. Red Sox Saturday at 3:30 PM ET" (PDF). FoxSports.com. April 19, 2012. Retrieved April 21, 2012. ^ a b "Philip Humber throws 21st perfect game in MLB history". ESPN.com. Associated Press. April 21, 2012. Retrieved April 21, 2012. 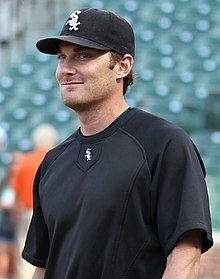 ^ "Philip Humber of the Chicago White Sox named American League Player of the Week". MLB.com. April 23, 2012. Retrieved April 23, 2012. ^ Gonzales, Mark. "Humber enjoying his 15 minutes of fame: White Sox right-hander gets phone call from Obama". Chicago Tribune. Retrieved April 23, 2012. ^ Krueger, John (April 24, 2012). "Humber's 'perfect' for Hall of Fame". Longview News-Journal. The Panola Watchman. Archived from the original on January 29, 2013. Retrieved April 25, 2012. ^ Dybas, Todd (April 21, 2012). "White Sox's Humber tosses perfect game". Yahoo! Sports. Associated Press. Retrieved April 21, 2012. ^ Kepner, Tyler (22 April 2012). "Humber, Pitcher of Perfect Game, Was Drafted by the Mets". The New York Times. Retrieved 23 April 2012. ^ Kepner, Tyler (2 June 2012). "In Mets' 51st Year, Finally, Their First No-Hitter". The New York Times. Retrieved 30 June 2012. ^ "No Hitter". ESPN.com. Retrieved April 21, 2012. ^ Miller, Doug (April 21, 2012). "Mariners dealt perfect hand they didn't want". MLB.com. Retrieved April 22, 2012. ^ a b "Felix Hernandez throws perfect game, overpowers Rays". ESPN.com. Associated Press. August 15, 2012. ^ Johns, Greg (August 15, 2012). "All hail the King! Felix throws perfect game". Mariners.MLB.com. Retrieved October 17, 2012. ^ Stone, Larry (August 16, 2012). "Perfect! Mariners' Felix Hernandez throws perfect game". The Seattle Times. Retrieved 2012-08-15. ^ "Felix rides soft stuff to perfect ending". ESPN. 2012-08-15. Retrieved 2012-10-12. ^ "Boxscore: Chicago White Sox vs. Seattle". MLB.com. Retrieved April 21, 2012. ^ "April 21, 2012 Chicago White Sox at Seattle Mariners Box Score and Play by Play". Baseball-Reference.com. Retrieved April 21, 2012. This page was last edited on 5 February 2019, at 05:20 (UTC).